When The Matrix first came out, people were wowed by not only the groundbreaking action sequences, but also the philosophical grandeur and metaphysical implications of the movie. We asked ourselves: What if we are all living in a dream? What if reality exists only in our minds? Are we like the prisoners in Plato’s cave, witnesses to only an approximation of reality? Perhaps there is a bigger and deeper ‘truth’ beyond what we know. What if I told you that this is actually not far from the truth? I’m not saying we’re all slaves to some evil overlords who have intentionally pulled wool over our eyes. However, like inhabitants of The Matrix, we are also living in a created reality. The key difference is that in the matrix, reality is created by the machines. In our lives, our reality is created by ourselves. Based on our beliefs about the world and about ourselves, we create our own responses, our own experiences, our own realities, and therefore our own lives. Knowing that we create our worlds based on our own beliefs, how can we better manoeuvre our inner worlds to achieve the results we want in the external world? Here are 5 life lessons from the Matrix. Life lesson 1: Our ‘truths’ have many layers. The deeper the truth, the greater the revelation. In The Matrix, there are many layers of truths. 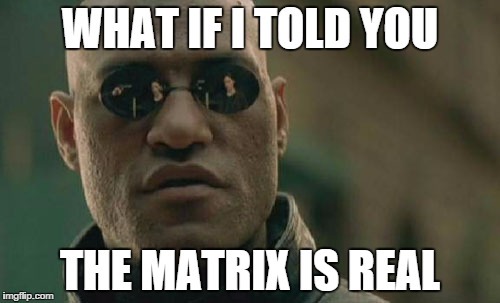 First, Neo discovered that The Matrix was a computer programme and that humans were enslaved as food sources for the machines. Then, he discovers that he is the anointed ‘One’, whose purpose was to free the humans. Next, he discovers that the One is actually another measure of control by the machines. Finally, he realises that instead of beating Agent Smith by force, the only way he can defeat Agent Smith is through surrender. Surface truth: Neo is ‘The One’, destined to free mankind. Deeper truth: ‘The One’ is another measure of control by the machines. Surface truth: The path to victory is through force. Deeper truth: The path to victory is through surrender. Like in The Matrix, each person’s truth is actually multi-layered. Digging into the deeper truths behind the surface level truths may bring greater insight into our psychology and patterns of behaviour. Addressing the root causes of our undesirable behaviours can come through acknowledgement and transcendence of our limiting and self-perpetuating beliefs. Surface truth: I’m really angry with my father. Deeper truth: I love my father and desperately want his approval. Surface truth: People don’t understand me. Deeper truth: I care for people but I don’t know how to show it. Surface truth: I must be independent. Deeper truth: I am afraid to rely on others as they may betray me. Life lesson 2: Because of these surface level mistruths that we have constructed to protect ourselves from the deeper, more aching truths, we often create vicious cycles in our lives. Jane is a workaholic. Jane longs to experience a loving and meaningful relationship with someone. However, due to a past failed relationship, she is now afraid of getting hurt again and reluctant to invest herself in social settings. To find fulfilment, she throws herself into her work, an area of her life she is competent in. However, because she never dates and works on the relationships in her life, she becomes lonelier. Being alone, she throws herself into her work. And so she creates the circumstance in her life where she would never get what she really wants, because she has covered up her deeper truth with a falsehood to protect herself from facing the painful reality. Like in The Matrix, the ‘fake’ world is a seemingly benign façade pulled over inhabitants’ eyes. Living in a virtual reality, these inhabitants have no control over their lives. However, they are protected from the grim reality of a crumbling world, a scorched sky, and tasteless gruel. Trinity says, “The Matrix cannot tell you who you are.” Similarly, our mistruths cannot tell us who we are. If we are looking for who we really are, we must dig into the deeper layers of ourselves. Life lesson 3: We can create new realities if we choose to see the truth. 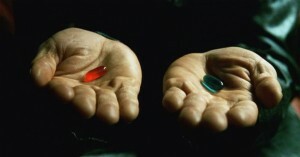 Like Neo, we also have a choice whether to take the red pill or the blue pill. And once we see the truth, we can either choose to overcome our struggles, or choose to continue living in a dream world. Though in denial at first, Neo eventually comes to terms with his position in the real world. This is in contrast to Cypher, who after experiencing the the real world, chooses to be plugged back into the matrix. Once we see the truths and acknowledge our own limitations, we have the ability to overcome them. If I can see that my fear of rejection is keeping me from reaching out to people, then I can also make the choice to reach out and seek the help and connection that I need. Let’s learn from Yuting’s story. Yuting used to consider herself a happy-go-lucky girl. Then she realised that she was merely wearing a happy mask, and beneath that happy mask was an insecure and angry girl who was dependent on others’ love and approval for self-worth and confidence. She realised that she did not love herself. So the way to break out of her vicious cycle was simply to love herself. If she had been unwilling to dig deeper beyond her happy mask, she might continue putting on a front and never figure out what she really needs to be truly happy. Life lesson 4: Overcome our inner selves and we overcome the external world. Whatever human beings create externally is a reflection of their inner state. Neo’s power in The Matrix depends on the degree to which he has let go of his limitations. Similarly, in real life, our ability to affect change in ourselves is dependent on the degree to which we have ‘let go’ of our false beliefs and attachments to the illusions, or the more surface level truths. Before Neo believed he was ‘The One’, he was initially unable to make the jump across the two skyscrapers. However, once he started to believe in his power, he was able to fight Agent Smith with only one hand and even stop bullets. The stronger he became psychologically, the more incredible his manifestations in the matrix and in the real world. Our outer state is a reflection of our inner state. So the more we have let go of our egos, the more we are receptive to inner truths and overcome them, the more we can achieve outwardly. Spoon boy: Do not try and bend the spoon. That’s impossible. Instead… only try to realise the truth. Life lesson 5: Sometimes the biggest fight is one we have with ourselves. From the start to the end of the Matrix films, Neo’s nemesis has always been himself. At the beginning, Neo has to overcome his own fear, doubt, and disbelief to finally accept his path as “The One”. After Neo starts to believe in himself, he then has to fight his antithesis Agent Smith. As Neo grows in power, so does Smith. His fight with Agent Smith is really his fight with himself. Similarly, we have fights going on in us. When you’re trying to make a decision, you may have many voices in your head. Maybe one would tell you to take the safe path and stay in your comfort zone. The other might tell you to take a risk and step into the unknown, to believe in yourself. One voice may tell you to keep to yourself; the other voice might tell you to trust other people. One voice might tell us to honour ourselves; the other might tell us to do what others expect of us. No matter what the fight is about, we always have a choice. No matter how many times Neo was beaten down by Smith, he chose to get up and keep fighting. Neo could have decided to rebuild Zion, or save Trinity; he chose Trinity.